Quality reports for selling jewelry. Do you want to sell some item or items on-line? Whether you are a dealer with hundreds of items that need professional descriptions or a consumer who wishes to sell only one or a few items of jewelry, you need to begin with a jewelry market report that contains proper and legal gemological descriptions along with expert assessment of metal purity, and mounting characteristics. You just can’t hope to sell a costly jewelry item with less than a professional jewelry description. Let us do this work for you and it will help YOU sell the jewelry successfully. Note: These reports are undated, so they do not expire or appear out of date. While dollar values can change, the condition of jewelry which is not being worn is very stable. We don’t dictate value or recommend using inflated appraisal jewelry market reports to help sell jewelry. Your asking price or your reserve price is for you, the seller, to determine. We have several certifications and guidelines in which we follow throughout the completion of all our services. To learn more about the certifications of appraisal practices that we follow for our quality reports, read our blog post named: “QUALITY REPORT USPAP and NAJA compliance statements”. Whether you are professional jewelry dealer or someone selling a piece or two, GIA Graduate Gemologist and Certified Senior Member, NAJA appraiser David S. Atlas provides you with unbiased, expert jewelry assessments. 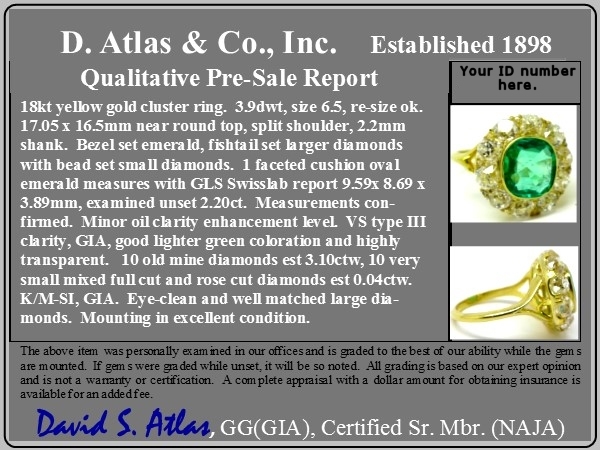 Work with David S. Atlas to receive reliable jewelry descriptions and market reports. These descriptions and reports will do wonders to help you decide the value of the jewelry you are selling. 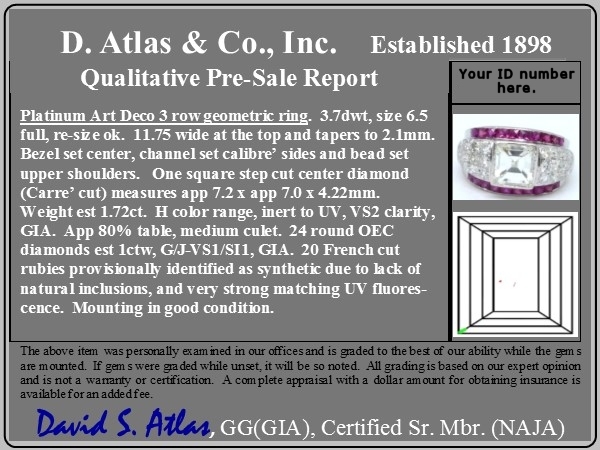 Book an appointment today to receive the descriptions and market reports for your jewelry by emailing d.atlas.co@gmail.com or call 215-385-0258.